Denver Chapter was formed 121 years ago, May 26, 1898. 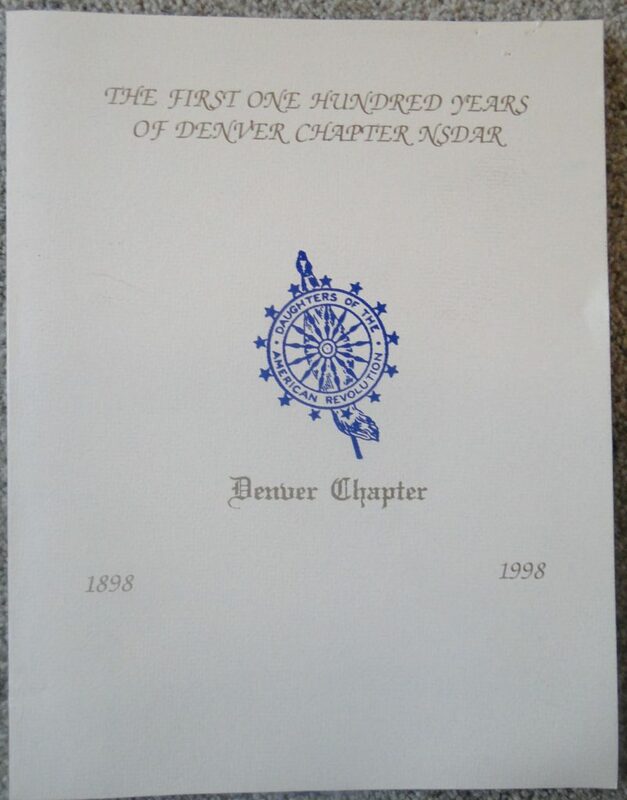 The most challenging of our centennial projects was writing the first one hundred year history of the Denver Chapter NSDAR. Some of this wealth of history follows. A unique contribution was made by Denver Chapter in 1902. The people of Denver and Denver Chapter joined in giving a silver punch bowl to the cruiser USS Denver. Denver Chapter NSDAR, in addition, donated a silver pitcher and goblet with the national DAR insignia engraved on it. 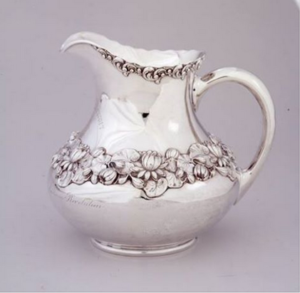 The pitcher was donated on April 19, the anniversary of the battle of Lexington. 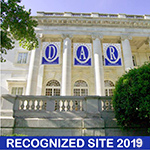 During this early period, DAR was a social as well as a patriotic organization. On November 14, 1910, Mrs. Jules Labarthe, Denver Chapter member and treasurer of the Colorado State Society NSDAR, advanced the idea for a Colorado state flag. A committee was formed, and after much work, the final design was a combination of one created by Denver Chapter and another by Andrew C. Carson. The flag was adopted June 5, 1911. An amended law in 1920 described the flag's colors more specifically and a second change in 1964 altered the proportions of the letter "C". Its design is significant. The large "C" stands for Colorado, Centennial State, Columbine and red color, which is "Colorado" in Spanish. The gold represents the greatest gold state, all year sunshine and one Columbine color. White stands for the greatest silver state, eternal mountain snow, and another Columbine color. A final feature of the original flag was the intertwining of the cords and tassels in silver and gold. Denver Chapter NSDAR along with Peace Pipe Chapter and Colorado Chapter, helped maintain the Washington Elm tree in Washington Park in Denver. Besides placing monuments and markers at various sites, Denver Chapter NSDAR along with Peace Pipe Chapter and Colorado Chapter, helped maintain the Washington Elm tree in Washington Park in Denver. 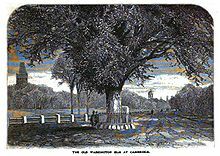 This tree is an icon of the Washington Elm in Cambridge, Massachusetts, under which George Washington took command of the Continental Army on July 3, 1775. When the original Washington Elm died in Cambridge in 1924, it continued to live through cuttings. In 1916, Denver city landscape gardener John Russell grew one of the cuttings here. In 1928 our chapter planted 38 oak trees in City Park as a Memorial Grove for all who wished to plant a tree in memory of a relative or friend. Sixty trees had been planted by 1930. Lack of care and water diminished the grove, and in 1976, Regent Mrs. James Perkins revived the Memorial Grove. The grove remains in place to this day, although City Park expansion has diminished the size of it. Throughout the years, other groves have been established in Cranmer Park on 2nd and Bellaire in East Denver and in the City of Brest Park on South Garfield and Cherry Creek Drive South. As needs changed in the United States, so did the emphasis of the work undertaken by Denver Chapter NSDAR. 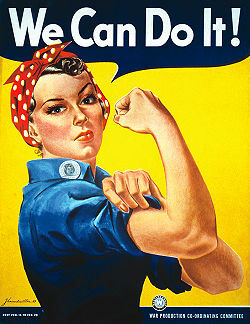 In the years 1941-1953, members helped with activities connected with World War II. The three chapters in Denver furnished and maintained the DAR lounge in the Men's Service Center. We contributed money, supplied hostesses and baked one hundred dozen cookies every week. In Red Cross work, Denver Chapter alone contributed more than 42,000 hours working in offices, hospitals, camps, and motor corps, and by knitting, sewing surgical dressings, donating blood plasma, teaching and recruiting other volunteers. During the war, members bought over a quarter million dollars in war bonds. Following the war, our emphasis returned to conservation, education, and historical preservation. We continued with essay contests, tree plantings, and work with veterans. We refurbished the solarium in Ward Lower W at Fitzsimmons Hospital and provided gold medals to eighth grade pupils for outstanding work in American history. Another endeavor of our chapter is to establish our own scholarships as well as the ones offered by NSDAR. To learn more about these, click on Scholarships. Denver Chapter has long been interested in scholarships and has given many awards to deserving young people. One of our members, Mrs. Edith Kennedy Wilson, left a generous bequest to Denver Chapter which endows a scholarship to a junior or senior student pursuing a business degree in one of Colorado's accredited four year universities. Denver Chapter NSDAR continues to give citizenship manuals to immigrants and the Children's Flag Code, relating the significance of the stars and stripes, and colors as well as a short history to school children. The same information is included for the Colorado flag. Our past regent, Maidie Mestek, received the 1997 Community Service Award for having given over 100 "Our Flag" programs in the Denver Public Schools. Jean Mitchell Taylor conducts genealogy workshops in Denver libraries for residents who are interested in learning more about their ancestors or who need help in filling out application papers in order to join NSDAR. Our programs still lean toward promotion of conservation, education, patriotism, and American heritage. Recent speakers have expanded our knowledge on Indian education in Colorado, the history of Fort Logan Cemetery, antique toys, women in the military and Salem witch hunts. 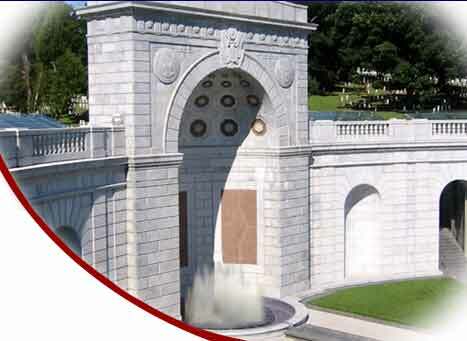 We are joining the national organization in helping to fund a memorial in Washington, D.C., honoring minority patriots who served during the Revolutionary War. In addition to sponsoring citizenship contests for outstanding high school students, we present an award annually to an outstanding teacher of American History.